Have you any idea what this might be? It was growing on the stems of Yorkshire Fog at Blue House Farm on 7th July. There were several others grasses present - Meadow Foxtail, Crested Dog's-tail and Creeping Bent among them - but this fungus was confined to Holcus. 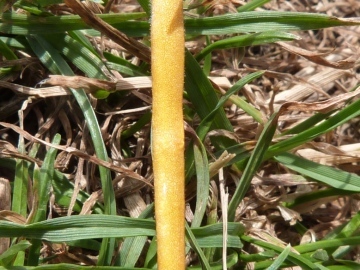 It had the texture of a Reedmace head but its slight hairiness may be those of the grass growing through it. I know you are one for 'little brown jobs so you might be able to point me in the right direction. Perhaps I should put the photo on the Club's Facebook page as I have been reading Simon's article in the last newsletter. I am afraid that Facebook and Twitter have always been a step too far for this old Luddite. All that Like and Dislike, Friends and Followers business - it sounds far too young for me! But then I once vowed never to use a computer, then vowed never to use the Internet, then vowed never to have an email address etc etc etc. Now the mere thought of writing all those letters instead............ And, of course, anything that helps promote the Club I'm all for.